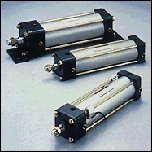 The adoption of steel material made high-power pneumatic cylinder possible. Urethane rubber used in dust wiper. Conforming to ISO Standards. (except as to bore 140 and 180) Non-lubrication system.